Easily access the latest information, check budgets or approve requirements and orders - all on the go. We are pleased to announce that our mobile team has expanded Cloud Purchase and developed CFM Purchase Mobile as an addition to our module. Users of CFM can download the app for iOS and Android for free. 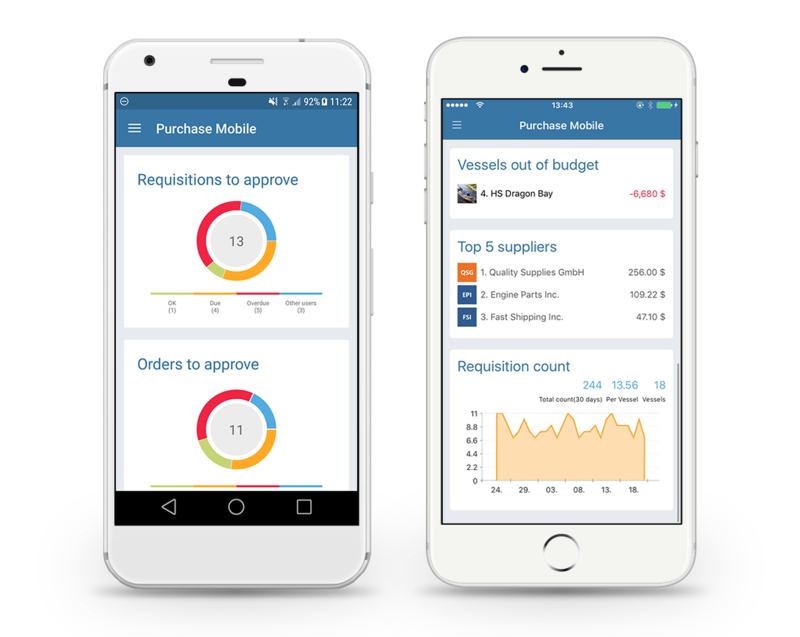 Our new app gives you the ability to quickly access the most relevant information, check budgets and grant approvals on the go. Do you regularly need to approve orders? Do you need to keep up to date with your OPEX and budgets? Are you constantly on the move or in meetings? With CFM Purchase Mobile you always have a smart and reliable solution to keep you up-to-date that enables you to perform the most important tasks even when you are not in the office or have access to a PC. Due to the intuitive and self-explanatory design of the app you are able to get the most relevant information within seconds. Are you aware of your ship’s budget state? Want to get a quick overview of your OPEX? With CFM Purchase Mobile you are integrated into all processes and are always up-to-date. Quickly review and approve requirements and orders in real-time, make faster business decisions and collaborate with your colleagues regardless of location. Benefit from the deeply integrated environment of Cloud Purchase and CFM Purchase Mobile. As soon as an order is approved your colleagues can immediately continue working, resulting in better transparency, visibility and streamlined workflows. Simplify your processes and stay in control with CFM Purchase Mobile.